Starting a flower garden, especially your first one can be a wonderful experience. There is something rewarding about being outside, working the soil, picking out plants, and seeing your labor of love turn into something quite beautiful. This post is all about starting your first garden and earning your green thumb. Deciding on the Location for your Garden …The first thing you have to think about is where you want to site the garden. If you have a place which gets 6 plus hours of direct sunshine, probably facing south-west, sun-loving plants will be really happy living there. If you have a location that gets about 4 hours of direct sun each day, most likely facing east, the sun lovers will not mind being there, and plants that like semi-shade will flourish. If you only have bright reflected light, or dappled-filtered light that comes down through towering trees, and/or you have north facing land, you will be planting a shade garden. Deciding how BIG and PREPARING the Planting Site …I think a new gardener should start small, and after a year or two, it they like gardening, expand. Starting with a garden that is just 3 feet deep and 15 to 21 feet long can be quite manageable for a fledgling gardener. At 3 feed deep and 15 to 21 feet long you will have ample space to plant a nice variety of perennials and annuals the first year. Marking off the Shape of your Garden …If it is Spring, and you are starting your garden now, take a yard stick and place it right up along the back surface where your garden will be extending out from (fence, wall of house or shed, etc). If it is going to be 36 inches deep, as I suggested, stick a bamboo stick in the ground 36 inches out from the back of your garden, at a corner where your garden will be starting (see illustration 1). Bamboo sticks are available for purchase at garden centers everywhere. They come in assorted lengths and are sold in bundles. I suggest buying the 36 inch long ones for this project. After inserting the first stick in the ground, go to the opposite side of your garden, where it will be ending, and measure 36 inches out from the back surface, and stick another bamboo stick in the ground there. Take a long piece of string and tie one end of it to the first stick, 2 to 3 inches above the ground. Take the other end of the string, and tie it to the other bamboo stick, also 2 to 3 inches above the ground. The string tied between the two bamboo sticks will be your guide, helping you to keep your garden’s edge straight, when you remove the sod. 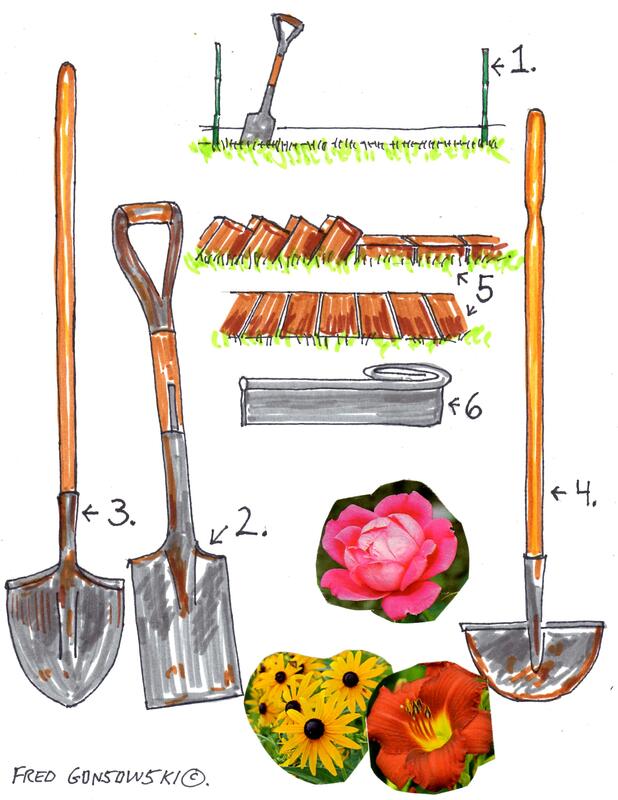 Removing Grass/Sod from the Garden area …Take a straight spade (illustration 2), and start slicing through the grass / sod working from one end of your garden to the other. As you slice down, try to pry up that piece at the same time. Slice and Pry working continuously across the front edge of your garden until you come to the end. After that start again, at the beginning of the garden, 6 to 8 inches in from that first cut. Cut again across the length of your garden. After that go back to the beginning of the garden, and with your straight spade, cut that long length of grass / sod into 6 to 8 inch long segments. Wearing Safety Glasses to protect your eyes from flying dirt, and a Dust Mask take a long-handled shovel (see illustration 3) and pry up the first few sections of sod you’ve cut. Bang them on the ground to remove as much excess soil form the roots of the grass as possible. If you can, leave the sod pieces, root side up, in full sun for a day. This will dry them out. You will be able to knock off even more dirt that way. After that throw away the pieces of old grass in the garbage. Don’t try to compost them, they will probably root again. Continue cutting row after row of sod, and banging off excess dirt until you have completely cleared the garden of grass. Edging your Garden …To stop the migration of grass from your lawn, into your flower garden, you will have to do / install some edging. The first kind of edging that I want to tell you about, probably has been done for hundreds of years. It is a process where you use an edging tool (see illustration 4) that cuts off excess grass as it grows from the lawn into your garden beds. The device looks like an ice chopper, and you will have to do it, probably 2 times each gardening season, to keep everything looking neat. A second option is to edge a garden in bricks. Illustration 5 shows bricks partially buried, set on angles, or on their sides, and bricks buried and laying flat along a garden, with only their top sides exposed. The third option, would be to have custom-made steel edging fabricated. I have seen this at the gardens of only the most well healed. A fourth option, the one that I have here at Whimsey Hill House is to outline the garden beds and borders with black plastic garden edging (see illustration 6). I like the black plastic edging because it is inexpensive, almost invisible, and easy to install. Just bury it deep enough so the rounded black top edge is just above ground level, so you can easily run the lawn mower over it without hitting the rounded top. Raised Beds …Sometimes what you want to do, and what you can do are two different stories. At my first house, I had many ideas about where and how big a garden I wanted. All my gardening dreams came to an abrupt end, when I started to dig / turn over the soil. The roots of 7 trees that I had taken down were everywhere, which made it almost impossible to turn over the clay soil I had. My solution was to make raised beds. Not wanting to do any sawing, I made three 8 foot by 8 foot planting boxes by stacking three rows of 8 foot long pressure treated railroad / landscape ties on top of each other. I kept the ties together with long nails made for that kind of project. I did not do it, but landscape fabric could be put across the bottom of the raised beds, so no plant life, growing at ground level could grow up to the raised planting surface of the new garden. The three 8 foot by 8 foot raised beds, places next to each other gave me a 8 by 24 foot garden to fill with plants. One IMPORTANT Thing …When making raised beds out of any kind of pressure treated wood, only plant flowers in them, never vegetables. Chemicals from the pressure treated wood could leach out into the soil and the plants could absorb the chemicals. You don’t want to eat things grown in those beds. If you want raised beds for vegetable gardening, only make them using natural pine or cedar boards. Preparing the Soil …I have never been blessed with good soil. I’ve had clay at my first house, and gravely sandy dirt here at Whimsey Hill. To both of those completely different soil types, to amend them (make better/improve), I’ve added a good amount of Sphagnum Peat Moss and Dehydrated Cow Manure. The sphagnum peat moss adds organic product to the gravely-sandy dirt, and has a way of helping it retain moisture. Mixed into clay, along with bagged top soil and shredded leaves, if you have them, sphagnum peat moss breaks up the heavy dense weight of that soil, adds organic material, and changes its consistency. I like dehydrated cow manure over composted manure because it is stronger and more full-bodied. Composted manure, here in my neck of the woods, seems to be mixed with sand as a filler. Sphagnum peat moss and dehydrated manure also give a boost of energy to bags of top soil bought at garden centers, by adding extra organic product to the bagged dirt. Back to Your New Garden Beds …To amend the soil in your garden, Step One turn it over to break it up, using the long-handled shovel. Step Two, spread the sphagnum peat moss, dehydrated cow manure, and any other amending products that you have over the ground. I like to use one big 3.7 cubic foot bale of sphagnum peat moss for every 12×12 foot of garden space, adding more if needed. With a rake, spread the amending products evenly across your gardening surface. Step Three, with your long-handled shovel, start turning the amending products into the soil. Work in rows north to south, then repeat it again, working east to west. Try to dig way down into the dirt. You want the amending products worked down a good 8 to 12 inches into the soil. You don’t want it to be a topical application. After working the products into the soil, even off the surface with a rake. Compressing the Ground …Standing on one side of your garden, slowly keep stepping sidewards, with your feet close together, working in rows. Do this until you have stomped down / completely deflated the soil. After stomping down the whole garden, rake one more time to even off the soil, it is now time to plant. Starting a Garden, that you will be planting NEXT year …If you are thinking about starting a garden, but don’t want to actually plant anything until next year, I have an easy way for you to clean the planting area of grass and its roots. Take newspapers that you have stacked in piles of 6 to 10 full sheets (don’t use pages with a lot of colored ink on them), or a single layer of cardboard, that you get from old boxes, that you have taken apart, and lay either of them on top of the grass in the area where you are planning on having the garden. Put some large stones or bricks on top of the layers of newspapers or cardboard, so the wind doesn’t blow them away. Cover the paper or cardboard with 2 to 3 inches of shredded pine bark mulch. Shredded pine bark mulch is quick to break down and decompose. In 4 to 6 months, the grass and its root system, smothered by the layers of mulch, and newspapers and/or cardboard, will have rotted away, and the area can easily be turned over, amended, and will be ready for planting. 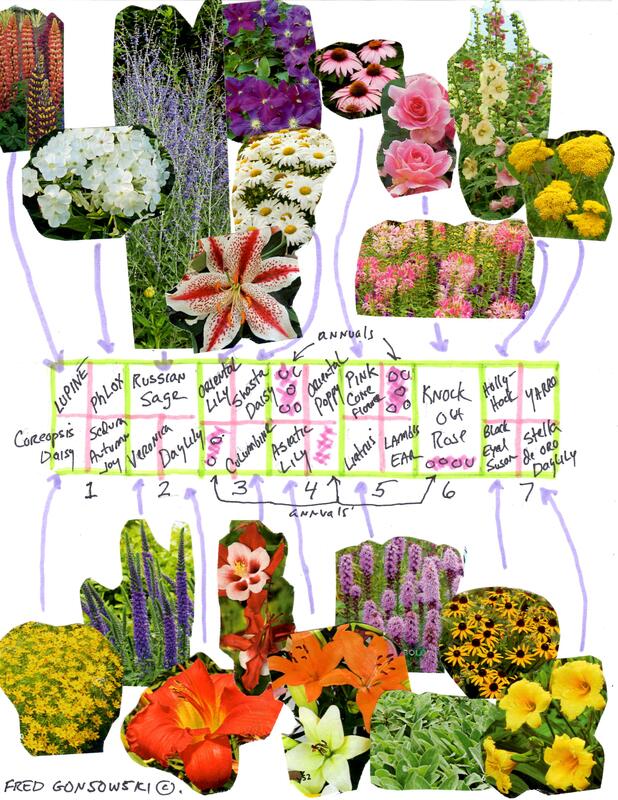 Plants for a Sun or Shade Garden …For you, the first time gardener, I have come up with two lists of plants to start either a sun or shade garden. The sun loving plants can hopefully be found at your local garden center, or big box hardware store or discount store that has a garden center. The shade lovers hopefully you will find at your local garden center or through mail order catalogs. All the plants on both lists are relatively easy to grow, are not heavy self seeders, and get fat and stay in place. SUN LOVERS ..(low growing for the front of the garden) Coreopsis Daisy, Sedum Autumn Joy, Veronica=Speedwell, Daylily (pick one in the color of your choice), Columbine=Aquilegia, Asiatic Lily (get a bag of 6 bulbs), Liatris=Gayfeather (get a small bag of them), Lamb’s Ear=Stachys, Black-Eyed Susan=Rudbeckia. Annuals to add color to the sun garden.. Annual Salvia, Zinnia (Cut and Come again or State Fair), Cleome, Marigolds, and Petunias. 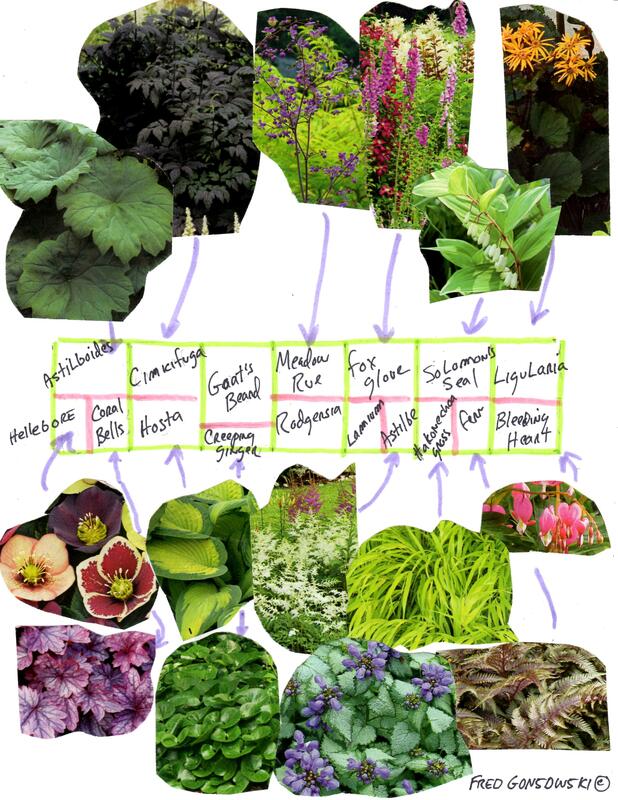 SHADE LOVERS ..(low growing for the front of the garden) Hellebore/Lenten Rose=Helleborus, Coral Bells=Heuchera, Creeping/Wild Ginger=Asarum, Rodgersia, Lamium, Astilbe, Hakonechoa macra All Gold Grass, Painted Ferns, Bleeding Heart=Dicentra. Shade lovers ..(back of the garden) Astilboides, Cimicifuga, Goat’s Beard, Meadow Rue=Thalictrum, Solomon’s Seal=Polygonatum, Ligularia. Annuals to add color to a shade garden..Impatiens, Caladium, Coleus, Tuberous Begonias. Both the full sun and shade gardens are 3 feet deep and 21 feet long. I’ve put numbers across the front of the gardens, so you can easily see each 3 foot section. In the garden for sun loving plants, notice that the knock out rose is planted by itself, in the middle of a 3×3 foot section of garden. Other plants are given an 18×18 inch space, or a 18×36 inch spot to grow. When planting a plant in its assigned location, put the plant in the middle-back of its space. Plants don’t grow toward the shade, they always grow toward light, even if they are shade lovers. If you lay out your garden following my directions, only buy one of each plant. In 3 to 5 years, if you like, you can divide them and extend the garden’s length and width. Along with the lists of perennials for the sun and shade gardens, I have added a few annuals to plant in groups of 3 or 6, here and there in the beds. Don’t overdo it with the annuals. Perennials will be much happier with light and air around them, when they are first starting out. Mulching the Garden …After planting your perennials and annuals, mulch the beds with 2 or 3 inches of mulch. Mulch will keep down weeds and help with moisture retention. I like Shredded Cedar Mulch. It smells nice when applied, and lasts a few years before you have to add extra. Don’t put mulch too close to your new plants. Start it 2 inches out from the stems/base of your plants. Another way to stop weed seed from germinating in your garden is to sprinkle Preen. Preen stops a lot of seeds from germinating. If you use it wear protective gloves, eye protection and a dust mask while applying the product. Don’t use it in vegetable patches. Preen does not eliminate weeds, that have already sprouted and/or are already growing. Put it on before you see weeds emerging, or right after the garden has been thoroughly weeded. WATER your garden twice a week. Let the water puddle on the ground, so there is enough to seep way down into the soil. You don’t just want to sprinkle the top surface. Adjust watering as needed, if it is rainy or you have a heat spell. This post is just the starting point of Earning Your Green Thumb. To learn about planting annuals read Planting Annuals, A beginning Gardener’s Guide 5-28-2011. To learn about planting roses read Roses, Planting Pruning and General Care 5-11-2011 or peonies My Peonies don’t/won’t Bloom 5-16-2011. To know more about planting a large garden read When Designing a Perennial garden, it’s all about the shapes of leaves 1-15-2011 and How to Plant (Design) a garden, Mass versus Specimen planting 2-17-2011. To know even more about siting plants read Stagger Plant Heights when Planting (Designing) a garden 2-23-2011, I’ve covered even more about the shade garden in my post When designing a Shade Garden, think Focal Point, Plant Color, and Shapes of Leaves 9-4-2011, If you want to add Spring flowering bulbs to your garden look at Fertilizing Tulips / Fertilizing Daffodils 3-14-2012. After reading some or all those articles, I think you will be ready to take on gardening like a pro. I now Bestow the title “Green Thumb Gardener” on You. So, now turn off the computer, and go outside and plant something! This entry was posted in planting a SHADE GARDEN, Roses, Peonies, Tulips, etc, The Spring Garden. Bookmark the permalink. Hallo Fred. Looking at the pictures of your garden (surely the US term “yard” could never apply to it – it’s a garden in the sense we use the word on this side of the Pond) the borders remind me of an English gardener, Gertrude Jekyll. My mother-in-law designed her garden using her principles, which resulted in beautiful borders in which colour and texture played a great part. Hi Grey Fox, I tried to make an estate kind of garden on 3/4 acres of land. If I were starting again, it would be much more formal. I’ve know how to plant things since I was 9 or 10 years old, but I really never saw high end plantings, like you see at fancy estates, until I went on Garden Conservancy Opening Day Tours in the Berkshires of Massachusetts, and The Litchfield Hills of North West Connecticut. Our area of upstate New York, no matter how affluent an area, does not have fancy gardens. Once I analyzed what professional gardeners were doing, and realized it was a lot of what I learned in art school, I saw gardening in a different light.